Whimsical Dolls are only $35. 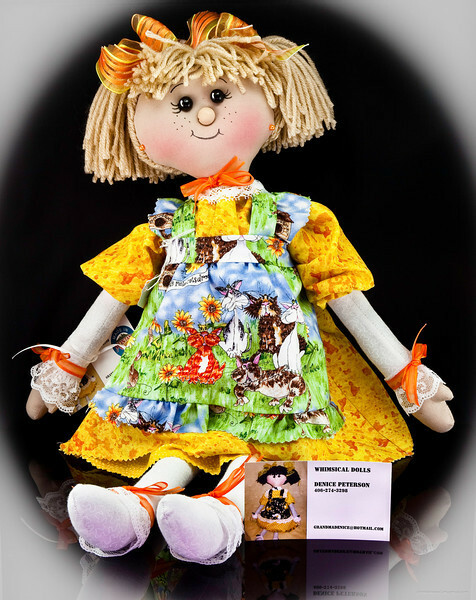 Soft body dolls made from 100% cotton. The doll is 18" from head to toe and 13" sitting. The bottom is weighted so they stay sitting. The clothes are not changeable as each are made unique. Not for small children. Great for Gifts and collectors. Grandmas and moms love them too. Email Denice Peterson :grandmadenice@hotmail.com or Call to order at 406-274-3298.